In Hear This, A.V. Club writers sing the praises of songs they know well—some inspired by a weekly theme and some not, but always songs worth hearing. This week: songs by Paul McCartney. Growing up I had two Beatles fanatics for parents—parents whose loyalties were divided between Lennon and McCartney, which led me to believe that choosing a side was somehow necessary to loving the band. (Perhaps it’s not coincidental that my parents got divorced from each other—twice.) At any rate, I subscribed for many years to my dad’s philosophy that Lennon was the superior and more “serious” songwriter, the tormented, primal scream-practicing genius who imbued The Beatles with all their artistic grit, while Paul McCartney supplied, as he put it, “the fluff” that made it palatable to listeners like my mother. Hey, I thought, I also dislike “fluff.” Ergo, I dislike Paul McCartney’s songs. 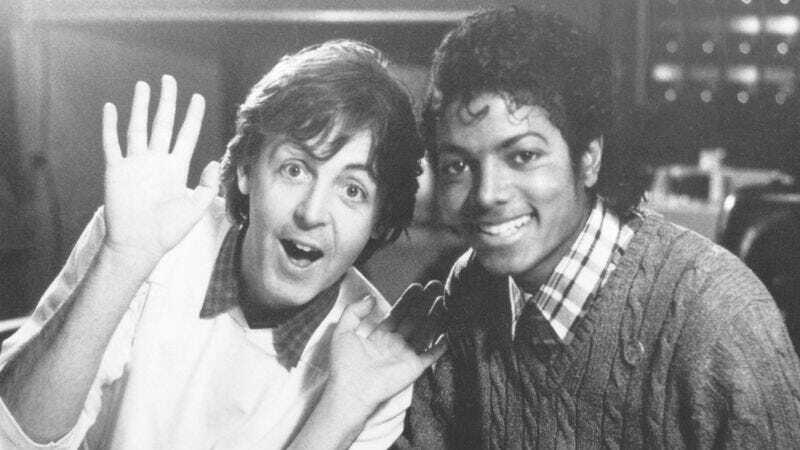 Put it in the context of its (admittedly absurd) music video, however, and “Say Say Say” suddenly seems less pleading than knowingly insincere—and far more clever than its innocuousness would suggest. In it McCartney and Jackson play traveling con men; while they’re begging their girl to stay and not play games, they’re the ones who are always leaving, to grift their way across the countryside. They’re not waiting anywhere near a phone. Just look at their (smiling) faces, and it’s clear those tears are not only drying; they’re painted on. As “Mac & Jack” peddle their snake oil and cheesy soft-shoe routine, along with hustling poor Harry Dean Stanton at pool, they’re hustling the object of the song’s supposed affection with their lofty, feigned language of love. Look at it this way, and it’s almost like McCartney and Jackson are openly acknowledging that all pop music is, essentially, hucksterism. It’s a beautiful lie that slides in on a graceful, stair-stepping, maddeningly catchy melody, does its familiar dance, tells you what you want to hear, and sells you on a false promise. Then it slips away, a beguiled audience in its wake and wads of cash in its hand. McCartney and Jackson are smilingly self-aware that they’re selling fluff, and that sometimes, fluff is all you need.